James Dyson CBE FRS FREng (born 2 May 1947) is a British inventor, industrial designer and founder of the Dyson company. He is best known as the inventor of the Dual Cyclone bagless vacuum cleaner, which works on the principle of cyclonic separation. According to the Sunday Times Rich List 2013, his net worth in 2013 was £3 billion. Dyson was born in Cromer, Norfolk, England, and was one of three children. Dyson was sent to Gresham’s School, a boarding school in Holt, Norfolk, from 1956 to 1965, when his father died of cancer. James excelled in long distance running: “I was quite good at it, not because I was physically good, but because I had more determination. I learnt determination from it.” He spent one year (1965–1966) at the Byam Shaw School of Art, and then studied furniture and interior design at the Royal College of Art (1966–1970) before moving into engineering. Dyson helped design the Sea Truck in 1970 while studying at the Royal College of Art. His first original invention, the Ballbarrow, was a modified version of a wheelbarrow using a ball instead of a wheel. This was featured on the BBC‘s Tomorrow’s World television programme. Dyson stuck with the idea of a ball which his brother had thought of, inventing the Trolleyball, a trolley that launched boats. He then designed the Wheelboat, which could travel at speeds of 64 kilometers per hour (40 mph) on both land and water. In the late 1970s, Dyson had the idea of using cyclonic separation to create a vacuum cleaner that would not lose suction as it picked up dirt. He became frustrated with his Hoover Junior’s diminishing performance: The dust bag kept becoming clogged with loads of dust thus reducing suction. The cyclone idea came from the spray-finishing room’s air filter in his Ballbarrow factory. Partly supported by his wife’s salary as an art teacher, and after five years and many prototypes, Dyson launched the “G-Force” cleaner in 1983. However, no manufacturer or distributor would handle his product in the UK, as it would disturb the valuable market for replacement dust bags, so Dyson launched it in Japan through catalogue sales. Manufactured in bright pink, the G-Force sold for the equivalent of £2,000. It won the 1991 International Design Fair prize in Japan. He obtained his first US patent on the idea in 1986 (U.S. Patent 4,593,429). After failing to sell his invention to the major manufacturers, Dyson set up his own manufacturing company, Dyson Ltd. In June 1993, he opened his research centre and factory in Malmesbury, Wiltshire. Dyson’s breakthrough in the UK market more than ten years after the initial idea, was through a TV advertising campaign in which it was emphasised that, unlike most of its rivals, it did not require the continuing purchase of replacement bags. At that time, the UK market for disposable cleaner bags was £100 million. The slogan “say goodbye to the bag” proved more attractive to the buying public than a previous emphasis on the suction efficiency that its technology delivers. Ironically, the previous step change in domestic vacuum cleaner design had been the introduction of the disposable bag — users being prepared to pay extra for the convenience. The Dyson Dual Cyclone became the fastest-selling vacuum cleaner ever made in the UK, which outsold those of some of the companies that rejected his idea and has become one of the most popular brands in the UK.In early 2005, it was reported that Dyson cleaners had become the market leaders in the United States by value (though not by number of units sold). Following his success, other major manufacturers began to market their own cyclonic vacuum cleaners. In 1999 Dyson sued Hoover UK for patent infringement. The High Court ruled that Hoover had deliberately copied a fundamental part of his patented designs in making its Triple Vortex bagless vacuum cleaner range. Hoover agreed to pay damages of £4 million. In 2005, Dyson incorporated the wheel ball from his Ballbarrow concept into a vacuum cleaner, creating the Dyson Ball, with the aim of making it more manoeuvrable. In mid-2014, James Dyson personally appeared in Tokyo to introduce his “360 Eye” robotic vacuum cleaner. Dyson’s initial entry into this market segment features 360° scanning and mapping for navigation, cyclonic dust separation, a custom-designed digital motor for high suction, tank treads for traction, a full-width beater bar, and user interface via a free iOS or Android app. In 2000, Dyson expanded his appliance range to include a washing machine called the ContraRotator, which had two rotating drums moving in opposite directions. The range was decorated in the usual bright Dyson colours, rather than the traditional white, grey or black of most other machines. The item was not a commercial success and is no longer available. In 2002, Dyson created a realisation of the optical illusions depicted in the lithographs of Dutch artist M. C. Escher. Engineer Derek Phillips was able to accomplish the task after a year of work, creating a water sculpture in which the water appears to flow up to the tops of four ramps arranged in a square, before cascading to the bottom of the next ramp. The creation titled Wrong Garden, was displayed at the Chelsea Flower Show in the spring of 2003. The illusion is accomplished with water containing air bubbles pumped through a chamber underneath the transparent glass ramps to a slit at the top from which the bulk of the water cascades down. This makes it appear that the water is flowing up, when actually a small amount of water diverted from the slit at the top flows back down the ramps in a thin layer. 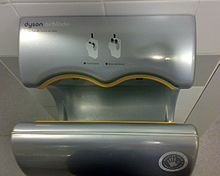 In October 2006 Dyson launched the Dyson Airblade, a fast hand dryer that uses a thin sheet of moving air as a squeegee to remove water, rather than attempting to evaporate it with heat. This allows faster drying, while using much less energy than traditional electrical hand dryers. Another product is a fan without external blades, which he calls the “Air Multiplier”. In addition to a cooling fan, a model which distributes electrically-produced heat is available. In February 2002, Dyson announced that production was being shifted to the Far East leaving 560 workers redundant in 2002 for economic reasons and because of difficulty acquiring land for expansion. The company’s headquarters and research facilities remain in Malmesbury. In November 2014 James Dyson announced plans to invest a further £1.5bn into the research and development of new technology, including funding for a campus at the Dyson UK headquarters in Malmesbury which will create up to 3,000 jobs. In 2014, Dyson said he would vote to leave the European Union to avoid being “dominated and bullied by the Germans”. Dyson set up the Foundation in 2002 to support design and engineering education – it now operates in UK, US and Japan. The Foundation’s aim is to inspire young people to study engineering and become engineers by encouraging students to think differently and to make mistakes. The Foundation supports engineering education in schools and universities, as well as medical and scientific research in partnership with charities. It achieves this by funding different resources such as the “Education box”, a box filled with activities for a school to use as a teaching aid. The Foundation loans the boxes to schools for four weeks free of charge, they are suitable for Key Stage 4 and above. The Education box enables students to take apart and examine a Dyson DC22 Telescope vacuum cleaner. In addition, a school is allowed to retain a James Dyson Foundation teacher pack, and a copy ofGenius Of Britain, a Channel 4 TV series featuring Dyson, and design engineering posters. Other resources are also available. In May 2014, the Foundation announced an £8m donation to create a technology hub at the University of Cambridge. A new four storey building will house 1,200 postgraduate engineers and support world-leading research. The donation will also allow for a design and making lab to be developed for undergraduate engineering students. In March 2015, the James Dyson Foundation pledged a £12m donation to Imperial College London to allow the purchase of an iconic Post Office building (located on Exhibition Road) from the Science Museum. Imperial will open the Dyson School of Design Engineering in the building, and teach a new four year Masters in design engineering, developing a new cohort of creative and theoretical engineers. The Foundation also supports the work of young designers through the James Dyson Award. This is an international design award that “celebrates, encourages and inspires the next generation of design engineers”. It is run in twenty countries and is open to recent graduates in product design, industrial design, and engineering. This profile is partly adapted from a Wikipedia entry on James Dyson, available under the Creative Commons Attribution-ShareAlike License.